Dixie Trucker’s Home, May 2011. A place this old and important to the history of transportation, and development of Route 66, deserves Historic Register status. But Dixie never got it. Granted, the original building burned down in 1965 and was replaced by the building that currently stands today, but Dixie isn’t just about bricks and signage, it’s about American history. Millions of drivers over the years stopped for huge helpings of meat loaf and chili as they headed west to find their dreams, or, in the least, found work as migrant farm workers. Dixie sat solid as the plains were molested by dust storms in the 1930s. She welcomed troops home as they headed east from Fort Leonard Wood, or northwest from Fort Knox in World War II, the Korean War, even Vietnam. C.J. and her husband lived through the latter and helped out during the former, and they both faithfully operated the place until 2003. After that, any road-tripper could sense the quality of food declined and the interior of the place became more hollow by the lack of pies, hungry truckers and goods, all replaced by cardboard signs dangling from the ceiling and a staff who could care less where the hell they were serving. What kind of traveler wants frozen, pre-packaged food deep fried until it resembles a ball of KFC served to them by an angry housewife all for the equally awful price too high to pay for a fist-full of garbage? The Stuckey’s corporation bought the Dixie and turned it into yet another road-side chain-operated dump. (Stuckey’s was started in 1937 by W.S. Stuckey Sr. in Georgia as a road-side pecan stand where his wife’s Pecan Log Roll and souvenirs eventually turned into a rest-stop dynasty, with all the crap you can afford off the shipping crates from China.) As a matter of fact, their Web site touts this latest special at Dixie— Current In-Store Promotion: Save with our new 2 for $5.00 mix and match promotion! Purchase any combination of our chewy boxed Salt Water Taffy or Hunkey Dorey for just $5.00. Who can resist a box of taffy while on the road? And we all know central Illinois is KNOWN for its taffy. We should all get in our cars and go there NOW! Buy every last damn box! I first stopped at Dixie Truckers Home in 2001. I sat next to a denim-clad, tattooed trucker with shades so dark I didn’t know if he had eyes. We dined at a counter as all the booths were full. We both ate three courses and enjoyed watching the waitresses flutter around in yellow uniforms with white aprons, plates and ice cream scoops in their hands and a lot of ZING in their step. There was energy there, and a lot of satisfied people. In 2005, the food was cold, inedible. I left leaving a $3.00 tip for the waitress who ignored me the whole time and had the pleasant manner of a 10-inch Black and white TV antennae in the basement of an apartment building. Another stop in 2006 was only worth it for the photo-op. There was no one eating, yet the parking lot was loaded with 16 and 18 wheelers — some churning in park, others ticking as they gassed up. But today, there were people in the booths — truckers happy and talking to wives and girlfriends on cell phones. The waitresses helped sling hash and the interior smelled, well, clean, with the inviting scent of burgers and the sound of a milkshake shaping up into creamy thickness. I didn’t get anything to eat, but I have a feeling Dixie is experiencing a Renaissance. Has Stuckey’s realized you can’t run every damn joint the same way across stretch of highway in America? That regionalism is as important to the health of this nation’s sense of pride as well as its commerce? I can’t answer that right now, but if you DO stop at Dixie, give it a try and let me know if it’s gotten better. If it hasn’t, you can at least walk through the mini Route 66 Museum right outside the bathrooms. You know, view the artifacts in reverence to the old Dixie, and then leave the turd where it should be. Dixie Trucker’s Home, October 2012. 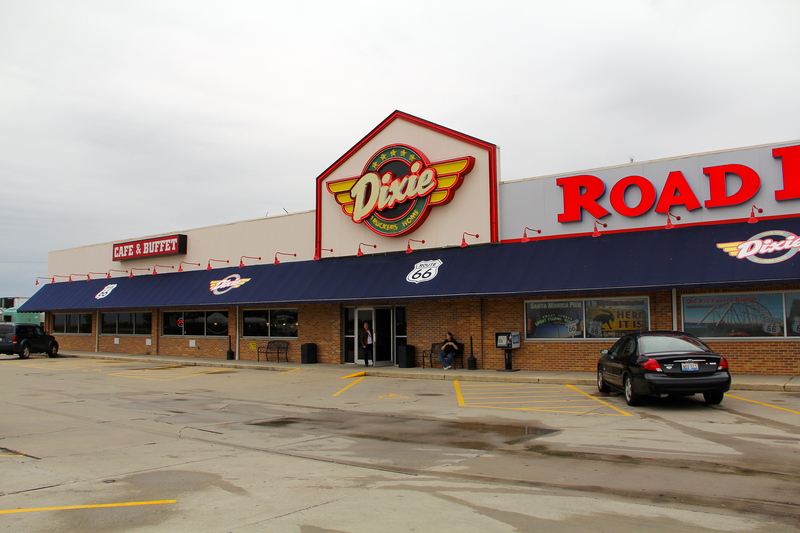 The Stuckey’s sign has been removed from Dixie, and the former Dixie Travel Plaza store is now called Road Ranger. The store carries very little on the way of Dixie merchandise, as if the entire left side of the building didn’t exist, but there are a lot of Route 66 tchotchkes emblazoned with the black and white Route 66 shield. The restaurant’s buffet is well stocked and steaming, and there are a few truckers inside eating, but the place isn’t crowded like it was 11 years ago. 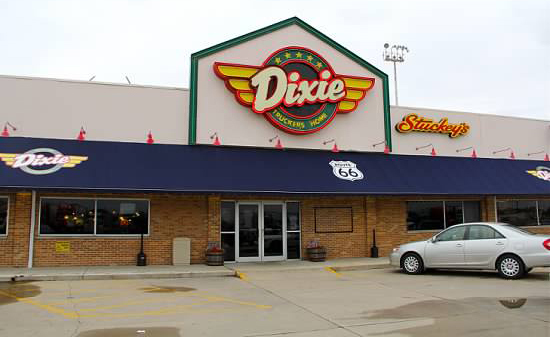 It seems Dixie is in an ebb again—the Route 66 museum that used to be inside is no longer there. The only thing that remains of the old Dixie is her sign, her name and the decor of gas globes lighting the booths. For me, it’s not about the look or name of the place, but the idea of treating the traveler like a part of something larger. When I first went to Dixie, I felt like I was being taken care of. I felt like a respected member of a group of people trying to capture an experience of an America that no longer existed, but now, I feel like a nameless customer with a wallet. Sure, the pie case is full and there’s food here—hell, even the waitresses are nice—but I can’t help but feel something’s missing. Dixie Trucker’s Home is definitely worth a stop, but it doesn’t feel like a part of Route 66. Right now, it’s just another good truck stop off the Interstate. Perhaps the new owners have something planned? Let’s hope it flows back into a true icon of The Mother Road.